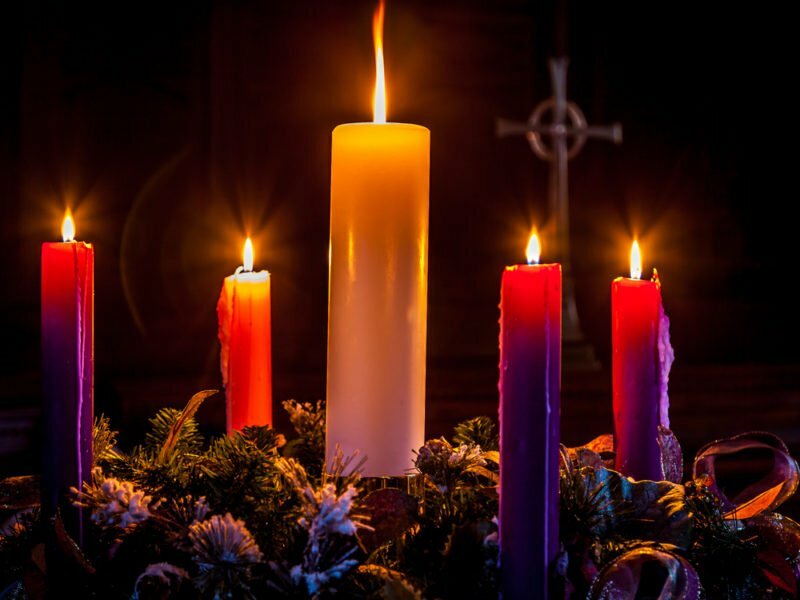 Have you ever wondered why there are four candles on an Advent wreath? The history is rich as the four candles represent 4,000 years. The time from Adam and Eve until Christ is about 4,000 years and each candle has a representation that only Christianity supports entirely. It is a time of waiting for the Savior of mankind as prophesied in the Old Testament. During the first two weeks of Advent, we light the first two purple candles. The Third Sunday of Advent is called Gaudete (Rejoice) Sunday. On this day we celebrate that our waiting for the birth of Jesus on Christmas day is almost over. Rose is a liturgical color that is used to signify joy, so we light the single pink candle on the third Sunday of Advent. This marks the second half of our waiting for the celebration of Our Lord’s birth. Can you imagine the joy the Mary, the blessed mother of Jesus, had when Jesus was born? No doubt Joseph exhibited joy at the birth of Jesus. Also, although he was aware of the significance of this child and how that he had nothing to do with the conception, he knew this was an act of God. Oh, the joy! Don’t you just love to watch and hold a newborn? It brings such joy to our spirit as we hold that child in our arms. I remember a few years ago I made it to the hospital in time for the birth of a grandchild and it was such a feeling to hold this little newborn girl in my arms as she was wrapped in a blanket and, at the weight of 10 pounds, all I could think of was a 10-pound sack of potatoes. Hey, grandparents think funny things sometimes. As I held that little girl I was reminded of Our Lord’s birth and the joy that must have overshadowed all present. After all, this is the birth of the Savior of humanity. The 1st Sunday of Advent symbolizes Hope with the “Prophet’s Candle” reminding us that Jesus is coming. Bethlehem.The 3rd Sunday of Advent symbolizes Joy with the “Shepherd’s Candle” reminding us of the Joy the world experienced at the coming birth of Jesus. Many traditions will include a white pillar candle in the center of the wreath representing purity and this is lit on Christmas Eve or on Christmas Day. Remember the joy of the Lord is your strength. Enjoy this season of Advent as we prepare for Christmas. This, like lent, is a great time for penance and preparation for the Second Coming of our Lord.